September is Prostate Cancer Awareness Month and we at WSHC wish for the men in our community to have all the tools to remain as healthy as possible. One of these tools is to raise awareness to make sure the men in our community can make informed decisions about prostate cancer screening and can advocate for themselves to get the screening tools they deserve. Each man should get screened for prostate cancer starting at the age of 50. If a man has a family history of prostate cancer he may need to get screened starting earlier than age 50. Screening involves looking for cancer before a person has any symptoms to help find cancer at an early stage. When abnormal tissue or cancer is found early, it may be easier to treat. By the time symptoms appear, cancer may be more advanced. If a screening test result is abnormal, more tests may need to be done to find out if it is cancer. These are called diagnostic tests. Prostate cancer is a disease in which malignant cancer cells form in the tissues of the prostate. 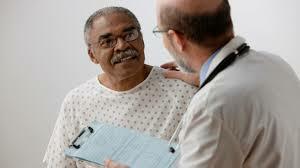 *Age, race, and family history of prostate cancer can affect the risk of developing prostate cancer. The prostate is a gland in the male reproductive system located just below the bladder. Prostate cancer is found mainly in older men. Although the number of men with prostate cancer is large, most men diagnosed with this disease do not die from it. Prostate cancer occurs more frequently in African-American men than in Caucasians and African-American men with prostate cancer are more likely to die from the disease than their Caucasian counterparts. The most important thing any man can do is to attend regular yearly physicals with his primary care doctor and to know his family history of prostate cancer. A family history of prostate cancer may increase a man’s risk of developing prostate cancer and may lead to screening before the age of 50. Most importantly please review your family history of prostate cancer with your primary care provider and make sure you discuss prostate cancer screening with your primary care provider starting at the age of 50 (unless you have a family history of prostate cancer; then you may need to start screening earlier). For more information regarding Dana-Farber Community Cancer Care, please contact us at (617) 632-5335 or (617) 989-3267. To schedule an appointment for a prostate exam, please call our office at (617) 989-3200 or (617) 989-3260. Our fax number is (617) 632-4088.